I try not to gush when I write. The only exception I can think of is a post about the Grand Canyon from a year ago and even the “gushing” there was done a bit ironically for humor’s sake. Okay I am done but seriously the novel was recommended by a good friend who is a not a “gushy” person but who did a fair amount of gushing about it. He was shocked and dismayed that I had not even heard of it. In my defense I have read several adequate books that he hasn’t. Though that is a weak defense because very few of the books I have read come close to attaining the mastery that is Gilead. It is fiction but written as the memoirs of a 3rd generation, small town Iowa pastor for his 7 year old son. The town has been shrinking for decades and at the time of his death is almost non existent. Many relatives and friends have come and gone, mostly gone and he is left, along with his best friend, another pastor who lives across the street. load an old pastor’s heart. His brother, the more driven of the two, became an atheist. His father moved away from the town and on his death bed could not understand why his son stayed. His godson has led a wreck of a life, impregnating two young girls without the financial means or know how to take care of them. He looks at boxes of his sermon manuscripts with a sense of dread, feeling guilty for most of what he said or wrote and hoping nobody ever reads them. And he is penniless, with no money to leave his much younger widow and son. Yet, even in his late 70s and near his death bed, he continues to study, prepare sermons, lead board meetings, council others and pray. He is the picture of a pastor who never quit being a pastor right up to his death bed. It is now becoming cliche to say that most books inform but the rare ones transform. Gilead belongs with the rarest of the rare. I have not felt so inspired since reading the first ten chapters of Les Miserables, which also told the story of an old pastor who never stopped being a pastor. 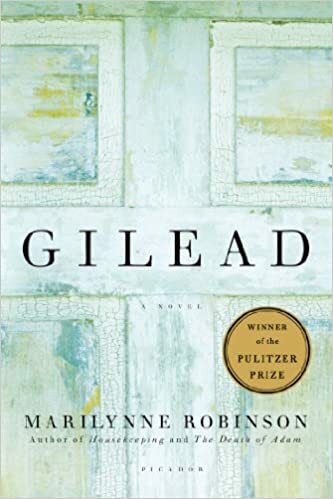 In Gilead’s final moments, the protagonist recalls the parable of the prodigal son to note that the angels in heaven don’t even rejoice over the righteous son who stayed home. In what I found to be the most poetic phrase in the book he says, “I am the one for whom the rejoicing in heaven will be comparably restrained.” The angels aren’t even throwing parties for me! My ministry is young, only about a decade old. I was called away by God from the small town that had much in common with Robinson’s fictional “Gilead” and now I am in a very prosperous suburb. I have a lot going for me and think it is quite possible I won’t leave my family penniless when I die. In fact, the way things are going, it is possible that my children will actually be in their 60s when I die and will have more money than me. What is more, my wife will probably die first. At least that’s how she wants it and I am okay with that because I won’t have to worry about leaving her penniless. But some days I can’t help but feel like this pastor in Gilead. After all, other than the boring sins of pride and selfishness, a bit of anger here and there with a bit of laziness thrown in, I have no scandalous stories to tell. My home was the Church of the Nazarene and I never demanded my share and stormed out of town. I don’t drink alcohol or do drugs and have never tried. I waited until I was married and now have two kids and a dog living a very American dream type life. I would like to think I spend my money well. I try to give it generously along with my tie. I am quick to reconcile and have a few other strengths that I play too while ignoring my weaknesses. To top it all off I spend time in prayer and fasting, not nearly enough but more than your average sinner. I am the son who stayed home. That isn’t too brag at all. That is just to say if I am one of the two sons, I am the one that dad’s not going to throw a party for or kill any fat cows to my benefit. I am the righteous son whom the rest of the world (along with the angels) rolls their eyes at. And that is okay. After all, as Gilead’s pastor reminded me, “There is no justice in love, no proportion in it and there need not be, because in any specific instance it is only a glimpse or parable of an embracing, incomprehensible reality. It makes no sense at all because it is the eternal breaking in on the temporal.” It would seem pointing people to that reality is its own reward. With that said, this short little review didn’t do “Gilead” justice. So please, go read the book, especially if you are a pastor! And try to survive January. May you find blessings in its cold, dark days. I actually just finished Gilead myself! I was reading it for a class I am taking this spring. It was a fantastic book! Great post Kevin! Thanks for sharing!